Kongur Tagh or Kongkoerh (Uyghur: قوڭۇر تاغ‎, Коңур Тағ; Mongolian: Хонгор Таг, Hongor Tag; simplified Chinese: 公格尔峰; traditional Chinese: 公格爾峰; pinyin: Gōnggé'ěr Fēng) (also referred to as Kongur) is at 7,649 m the highest mountain wholly within the Xinjiang Uyghur Autonomous Region, China. Kongur Tagh (towards the right edge of the photo) and Kongur Tiube (center) as seen from lake Karakul. The Kongur Tagh range in 2005. The summits visible from the viewpoint on the Karakoram highway to the south west are those of Kuk Sel (6,715 metres) and Kezi Sel (6,525 metres), about 5 km and 7 km south of the main summit. Kongur Tagh is within a range called the Kongur Shan (Chinese: 公格尔山; pinyin: Gōnggé'ěr Shān.) Kongur Tagh is located just north of Muztagh Ata and visible from Karakul Lake. Some sources use "Kongur Shan" mistakenly to refer to the peak itself. 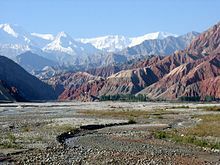 The Kongur Shan range, including Muztagh Ata, is separated by the major Yarkand River valley from the Kunlun Mountains and thus is sometimes included in the "Eastern Pamirs"  Kongur Tagh is the highest peak in the Kunlun Range, and is higher than any peak in the Pamirs as well. Due to its remoteness and being hidden by nearby peaks, Kongur was not discovered by Europeans until 1900. However, the building of the Karakoram Highway from Pakistan to China, which runs past nearby Tashkurgan and Karakul Lake, has now made it more accessible. Administratively, the Kongur Range is within Akto County. The first attempt to climb Kongur Tagh was made in 1956 but the party aborted the attempt when it realized it was beyond their abilities. The first ascent of Kongur Tagh was completed in 1981 by a British expedition consisting of Chris Bonington, Al Rouse, Peter Boardman and Joe Tasker. This is taken from the Guide to Mountaineering in China. Some Chinese authorities give it 7,719 m, but evidence against this higher elevation is given here. Kongur Tagh has a significant subpeak known as Kongur Tiube (Chinese: 公格尔九别峰 which means in the local language "the mountain with a white cap", also Kongur Tiubie / Jiubie and Kungur Tjube Tagh), 38°36′57″N 75°11′44″E﻿ / ﻿38.61583°N 75.19556°E﻿ / 38.61583; 75.19556﻿ (Kungur Tjube Tagh); elevation = 7,530 m (24,705 ft).Ranked 47th It is moderately independent, with a topographic prominence of 840 m (2,756 ft). It was first climbed in 1956. ^ a b c "China II: Sinkiang - Xinjiang". Peaklist.org. Retrieved 2014-05-26. ^ Ward (1983), pp. 146-148. ^ Kongur Tagh-Muztagh Ata Topographic Map, 1:100,000, by the Lanzhou Institute of Glaciology and Geocryology, Chinese Academy of Sciences, ISBN 7-80545-148-6. Ward, Michael. (1983). "The Kongur Massif in Southern Sinkiang." The Geographical Journal, Vol. 149, No. 2 (Jul., 1983), pp. 137–152. Wikimedia Commons has media related to Kongur. "Kongkoerh, China". Peakbagger.com. Retrieved May 23, 2008. This page was last edited on 30 October 2018, at 00:24 (UTC).